Traders and financial professionals work at the opening bell on the floor of the New York Stock Exchange (NYSE), December 14, 2018, in New York City. Stocks fell sharply on Friday after weaker-than-expected data in China and Europe exacerbated concerns of a global economic slowdown. 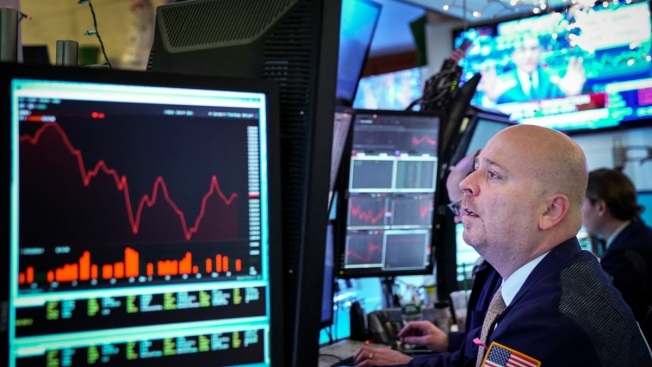 The Dow Jones Industrial Average fell 496.87 points to 24,100.51, its lowest level since early May, led lower by declines in Apple and Johnson & Johnson. For the year, the Dow is now down 2.5 percent. The S&P 500 dropped 1.9 percent to 2,599.95 — its lowest closing level since April — as the tech and health care sectors lagged. The broad index also closed down 2.75 percent for 2018. The Nasdaq Composite pulled back 2.26 percent to 6,910.66. For the year, the tech-heavy index is now up just 0.11 percent. Friday's losses also wiped out the gains for the week across the major indexes. Friday also marked the first time since March 2016 that all major indexes closed in a correction, down at least 10 percent from their 52-week highs. China reported industrial output and retail sales growth numbers for November that missed expectations. This is the latest sign shown by China that its economy may be slowing down. The data also underscored the rising risks to China's economy as Beijing works to resolve an ongoing trade war with the U.S.
"The economic data continues to bear out growth is slowing," said Tom Martin, senior portfolio manager at Globalt. "There is still a lot of positive positioning out there. As the data continues to slow, people are feel less comfortable with that and start to sell." Markets slump on fears of a global slowdown — Four experts on what to watch next from CNBC. "Where we are is trying to measure how uncomfortable people are with their positioning," Martin said. "There just hasn't been any follow-through in any rally we've seen in the past few weeks. That's very telling of the market." Industrial production in China grew by 5.4 percent for November on a year-over-year basis, the slowest pace in almost three years. Retail sales, meanwhile, grew at their slowest rate since 2003. European shares also fell after the release of weaker-than-forecast data. The IHS Markit Flash Eurozone PMI index fell to 51.7 in December, its lowest level in four years. "New business inflows almost stalled, job creation slipped to a two-year low and business optimism deteriorated," IHS Markit said in a release. Stocks initially surged this week amid hopes the U.S. and China would be able to strike a permanent deal on trade. On Friday, China said it would suspend an additional tariff on U.S. autos. China also confirmed it would reduce a 40 percent charge on U.S. auto imports to 15 percent for 90 days. But the uncertainty around the ongoing negotiations has kept investors on edge recently. Data from research service Lipper found that more than $46 billion were pulled out in a week from U.S. stock mutual funds and ETFs, the most ever. "At this point, a lot of investors are very cautious heading into 2019," said Yousef Abbasi, director of U.S. institutional equities at INTL FCStone. "There's a lot of frustration among investors that have been whipsawed by this volatility." Volatility has picked up this quarter. This is the third decline of more than 500 points for the Dow in December, following two declines of that magnitude or greater in November and three in October. Shares of Apple fell 3.2 percent after influential analyst Ming-Chi Kuo, of TF International Securities, slashed his iPhone shipment estimates by 20 percent. Johnson & Johnson, another Dow member, fell 10 percent after Reuters reported the company knew about asbestos in its baby powder for decades. The S&P 500 financials sector closed down 20.06 percent from its 52-week high, officially entering bear-market territory. The sector fell 1 percent on Friday as worries about global growth dented bank shares.